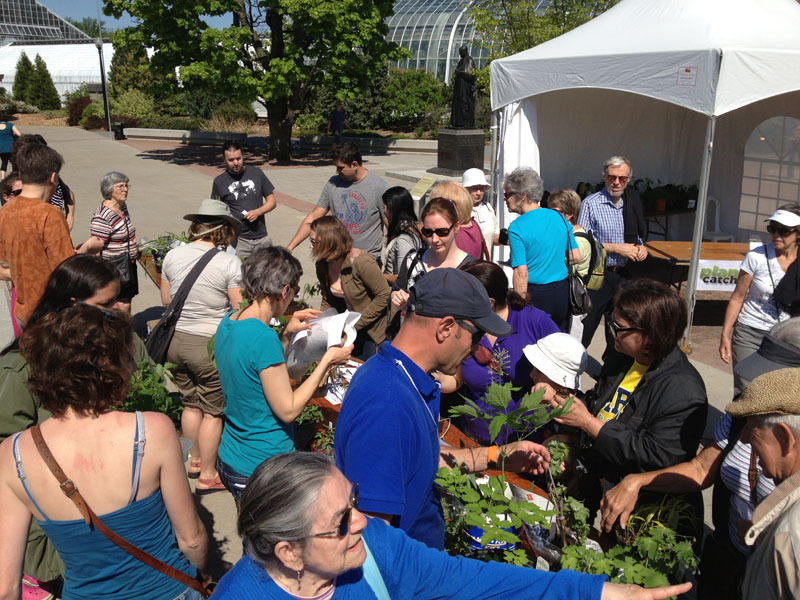 On Sunday, May 25, 2014 this big plant sharing event held by PlantCatching and the Botanical Garden took place. The event was led by me, Nicolas Cadilhac, initiator of PlantCatching and Albert Mondor, well-known Quebec horticulturist. However, before speaking about the event itself, I'd like to tell you how this activity came about. 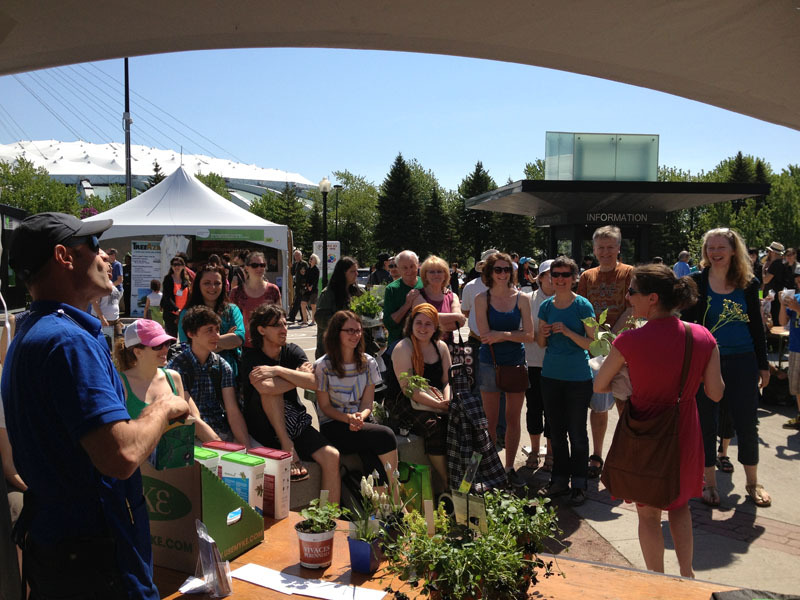 As you know, I have been trying for 2 years to have all the gardening and urban agriculture stakeholders get to know PlantCatching .In the process, I have had the honor of being invited to present my project at large gatherings, such as UQAM's summer school in urban agriculture in Montreal in 2012 and the seed festival (Fête des semences de Québec) in 2013. Even so, I was feeling somewhat frustrated two years after the launch of the platform on the web, that the connection between the Botanical Garden (and friends of the garden) and PlantCatching still did not exist, especially since the Garden is such a big, beautiful institution in my own city. When I saw that the famous Great Gardening Weekend was looming on the horizon, (it was two months away) I decided to call the event organizer, Dominique Proulx, to put forward a very cheeky idea: get PlantCatching involved, in some way or other, during these 3 days. When Dominique called me back, she mentioned to me straight off that she'd had an idea in mind for some time. 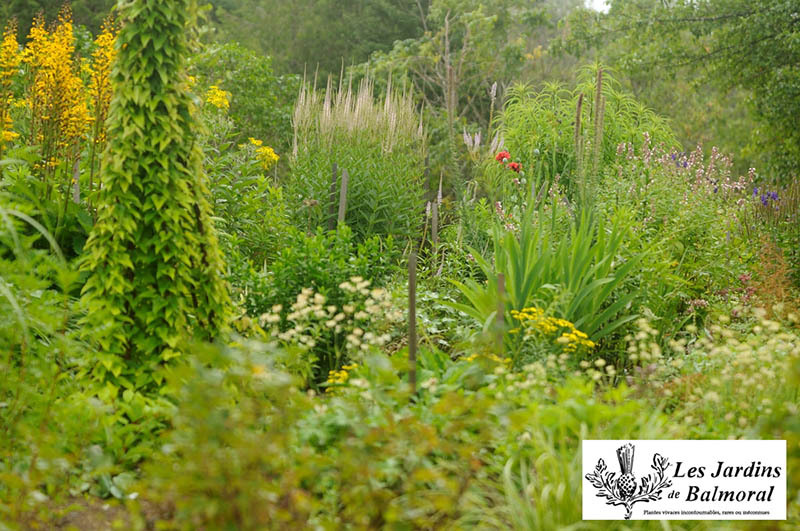 She wanted to organize an exchange of perennials but did not yet know how to make it happen. Can you see what great timing and good luck this was? After that and a few days to think it over, the matter was decided. 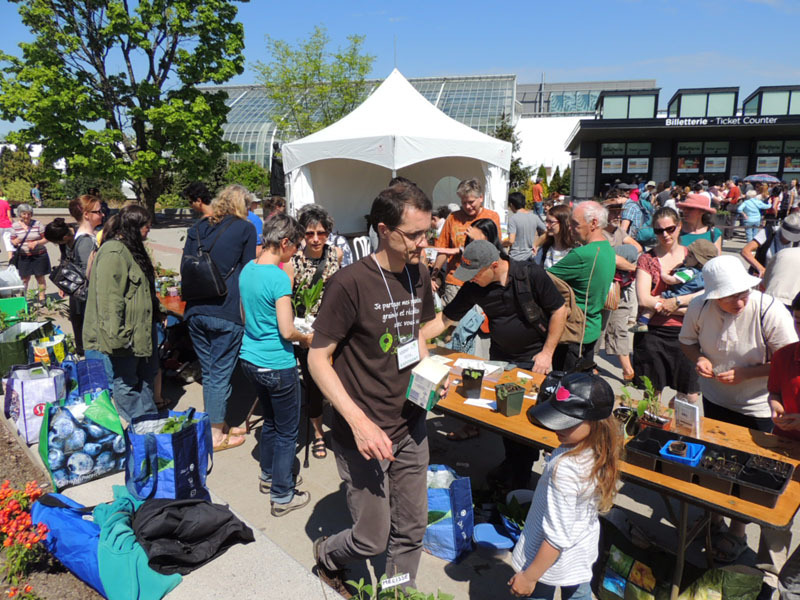 I would organize on the sidelines of the well-known Montreal event, a gathering of gardeners to share plants brought for the occasion by all participants. I now had to give the Botanical Garden team an outline of how this activity would function. First, I was scared of having to design something very complex. Should it be a standard exchange? Should I develop an algorithm to satisfy everyone and rules limiting the number of plants acquired according to the number of plants brought, for every gardener, etc.? My head was spinning and I almost told Dominique that the challenge was too great. Then I realized we were talking about PlantCatching after all! Not a conventional plant swap. Participants would no longer have to share but simply to give. Rules suddenly faded and it was possible to go with a much more relaxed implementation. Despite this, I still had to code new pages and features on the website. 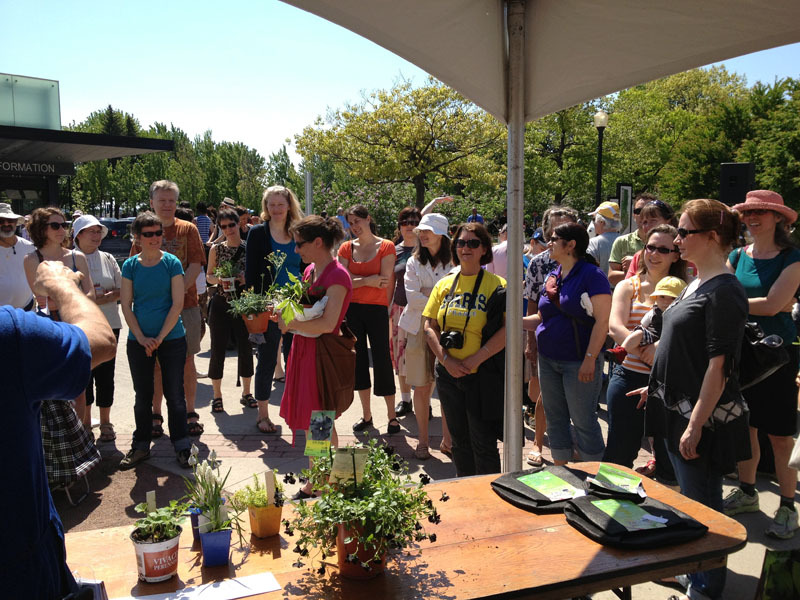 Participants had to be able to record their plants for the event and everyone had to be able to see the updated list of available plants. Plus there were the different pages and texts for promotion. Then one day Dominique mentioned that I could have someone from the Garden itself available to talk with people about the plants. Now you all know about my relationship with Albert Mondor; I did not hesitate one second to suggest his services for the occasion. She immediately agreed, and he did too. Albert Mondor gives many talks and workshops. He usually offers door prizes (or what I myself call a prize draw) at the end of his speeches. So naturally he offered to bring me beautiful plants for the final draw (Dominique added to this free entrance tickets to the Botanical Garden).And since Albert was redoing his own garden, he would also share plants with the gardeners present. It was from these developments that the system of entrance tickets came to mind. One ticket per person let me keep a record of the people registered, the plants they would bring and it also became the paper to put in the hat for this famous draw. To inject a bit of enthusiasm into the process, only those with tickets who had given at least one plant would be included. This, I hoped, would motivate everyone to bring quality plants. All participants need to first have an account on PlantCatching in order to pre-register each plant they are bringing. Preregistration is nothing more than using the usual form for sharing plants with the addition of a small checkbox to indicate that the shared plant is for a particular event. A few hours before the event, the organizer prints all the tickets for those registered. 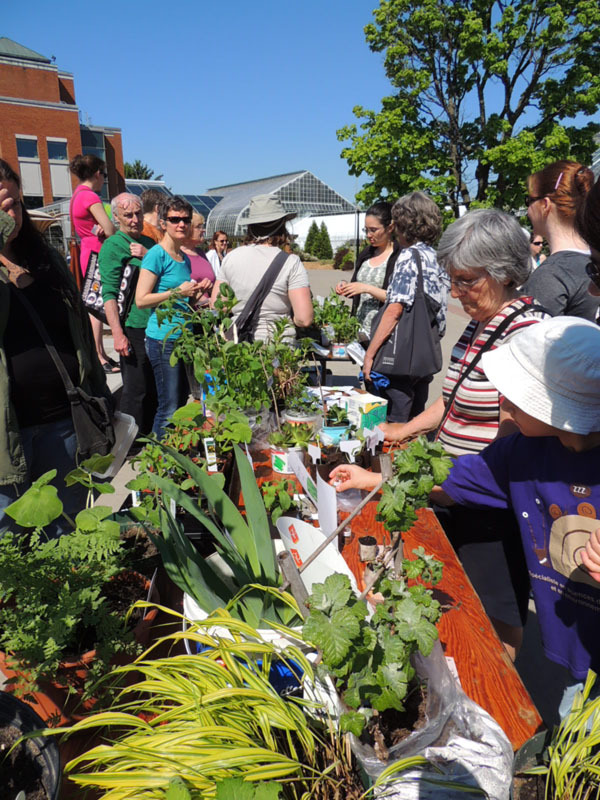 Each ticket can include the plants brought to the event. Note to self: take blank tickets to accept any gardeners who have not preregistered. Although optional, it's a good idea to organize a random draw. This shows the playful side and adds a little extra fun. And who doesn't love to win something unexpected? Five days before the event, I'm stressing. Only 8 peoples have pre-registered plants. I share my worries with Dominique but she's preoccupied with organizing the Great Gardening Weekend and I sense that I just have to sort things out by myself. It is time to spread the word as much as possible on several of my networks. I send lots of emails and post messages on Facebook. Jasmine writes me a beautiful note of support on her blog. Albert mentions it throughout the Great Gardening Weekend. Gradually the entries start to add up. Two days before, there are 20 people. When I get back from St-Elie-de-Caxton and its Plant Bazaar on Saturday night, I get ready to print entry tickets for 30 participants. The day of the event, I frantically check the numbers and 2 more had been added overnight. Phew, the plant exchange can begin. I am so relieved. 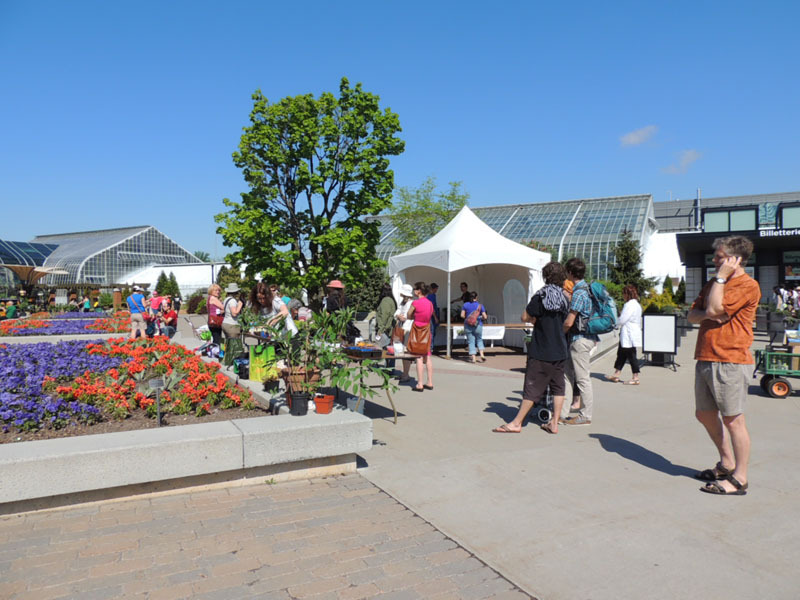 I had planned ahead of time that Friday, the start date of the Great Gardening Weekend, would be my day to go buy plants from the many producers present at the event. I have a whole flowerbed to redo and a neighbor asked me to design one for her. Here I want to salute producer, Philippe Levesque of The Balmoral Gardens. He's the one who received my largest order; first because he answered all my emails within 24 hours and second, because he has a wonderful catalog of splendid perennials. When I went to see him, besides finding the very nice person who was behind our communications, I left with 6 plants that he wanted to add to the Plant Sharing prizes. All fired up by this generosity, I went to see someone I had met before, Nicolas Ste-Marie at the Urbainculteurs' stand. While discussing the hope of one day seeing his organization become a bamboo of PlantCatching, he also gave me smart pots for the draw. So like me, you see that there is a potential for sponsorship of Plant Sharing events. What’s more I received an invitation to attend the awarding of the Henry Teuscher prize to Albert Mondor, which honours his career and contributions to the world of gardening. A very beautiful and moving moment. All this was followed by beverages and biscuits. There I meet Geneviève Rioux, who together with Albert, shaped my enthusiastic gardening debut on the show Le tour du jardin (Around the garden) on Historia, the French version of the History Channel. She loves PlantCatching. Then my wife and I disappeared to leave all those people who have known each other for a long time, have a good time. Sunday morning, 8:30 a.m. and I arrive ahead of time at the Place Marie-Victorin to quietly get ready. With my PlantCatching T-shirt, maybe I catch the eye of the curious. A small white tent has been set up for me. Folding tables are waiting. I set everything up, taking my time to put my display counters in place and unroll my small banner, which follows me everywhere as I present my project right and left. Some people arrive early and go for a walk until the start of the event. Dominique welcomes me and introduces me to the Garden's supervisor who wants to see this sideshow for himself. 9:30 and the participants start to arrive one after the other. I'm pleasantly surprised to see all ages, from young people to seniors. "Hi." "Hello." "Put your plants on the table." "Marie-Josée? Ah yes, I know that you are in the tickets ." The pace is picking up. I give some instructions to several people at once who are wondering about how the actual sharing will proceed. Plants are piling up. The stone benches are requisitioned to support the weight of plant material. There's an abundance. Dominique is all smiles. Everyone is milling around. The sky is blue and the weather 's ideal. Albert, all dressed in blue with an apron, looks like a star, comes and goes, totally at ease among the participants and visitors to the Great Gardening Weekend. All this small hive is abuzz. "When do we start?" is the question that pops up the most. Two or three people start wild exchanges that I try to calm down. The excitement is palpable. I ask everyone to help me receive the newly arrived plants because I don't know where to turn. 10 o’clock and I get up on the stone bench and start speaking but my voice only carries so far in the middle of all the hustle and bustle. I set out a couple of rules. They could be summed up as "You’re free to share, chat and enjoy ourselves." And we’re off! Apart from punching tickets when a person gives away his first plant, I don't have much to do. I look at all these smiling little gardener ants fussing about with excitement and joy. They want to know who is it that gives such and such a plant, to thank them or to ask them questions. They try to attract attention to what they are offering. They revolve around the tables to make sure they miss none of what is on offer. Latecomers try to fit into this cheerful crowd. Albert, who is in great demand, is giving out gardening advice and touting the merits of this or that perennial. He having fun, and it shows. Me, as well. I relax and take some photos. I know that the challenge is won. 11 o’clock and it's time to stop the exchange anyway, because the tables are empty! So I collect the stamped tickets into a box (not difficult, coz they're all stamped) . I suggest to Albert that he draw the winners. There's no one better than him to present this activity. With his kind words and his little jokes, he gets along well with everyone "Ah, ha, I see you are turning to your wife to be sure that the prize you choose is the right one! That's how it goes in a couple. " By an extraordinary stroke of good fortune, the number of prizes matches the exact number of participants. Everyone will leave with another plant, mycorrhizae and other fertilizers or free entries to the Garden. Gardeners’ cheering marks the end of the plant exchange. Some people come and chat with me about the success of the event. A bit later, Albert comes to congratulate me and welcome me into the world of horticulture because, according to him, although I had once worked for him, today was my rite of passage. He also confessed to never having witnessed this kind of sharing before and he thinks it should be repeated no matter where in the world under the PlantCatching banner. It is time to put things away. Time to fold up the tables and close up the small tent. A bit gloomy, I walk down the alley of the Great Gardening Weekend. I talk a bit about the sharing with Michel Corbeil, who owns the nursery of the same name (Partage).He tells me that he too could donate plants for prizes. That is very good news. I call my wife and children. I go home. Dominique Proulx and I'll meet again next week when she is back from her well-deserved leave. I hope that a definite wish to organize another plant share in the Botanical Garden will come out of our meeting. In this regard, I would like to have your feedback about this beautiful day and especially about what things you would like to see improved. There is always something to do a little better, so don't be afraid to speak out. You can share your comments in the section at the bottom of this page. If however, you would rather comment in private, send me an email. I’ll be bringing it all to Dominique, so don't leave it too late. I wonder if, like Albert said, PlantCatching couldn't be used to organize this kind of sharing event, in Quebec, France or Australia. The support pages could be put in place so that an organizer, anywhere in the world could quite easily do it. What do you think?? I am writing to congratulate you on the event. What a success! I felt spoiled and privileged to take part in this first exchange event. I left with my arms full, with a door prize and tons of gardening tips. The participants were so friendly and generous, it was wonderful! Well done! Some of these photos were taken by a participant, Ann Boisvert. Thank you Ann!